Rabbi Dovid Asher, Rav, Keneseth Beth Israel/Rabbinic Administrator, The Va’ad HaKashrut of Richmond, Richmond, VA; Rabbi Hershel Becker, Rav, Young Israel of Kendall, Miami, FL; Rabbi Yechiel Biberfeld, Rosh Kollel, Philadelphia Community Kollel; Rabbi Azriel Blumberg, Corporate Kosher Liaison, KVH Kosher, Brighton, MA; Rabbi Meir Bulman, Rav, Hebrew Orthodox Congregation, South Bend, IN; Rabbi Benzion Chanowitz, Rav, Landfield Avenue Synagogue, Monticello, NY/Director, Chabad of Monticello/ Mashgiach, STAR-K Certification; Rabbi Barak Cohen, Rav, Ohr HaTzafon, Saint Ives, New South Wales, Australia; Rabbi Josh Finegold, Administrator, Buckeye Kosher (Vaad Ho’ir of Columbus), Columbus, OH; Rabbi Mayer Freedman, Rav, Congregation Anshi S’fard, Atlanta, GA; Rabbi Yonatan Gorin, Rav, Congregation Etz Chaim, Sharon, MA; Rabbi Yonah Gross, Rav, Congregation Beth Hamedrosh, Philadelphia, PA; Rabbi Sender Haber, Rav, B’nai Israel Congregation, Norfolk, VA; Rabbi Eliyahu Hakakian, Rav, Ahavat Shalom Sephardic Congregation, Baltimore, MD; Harav Boruch Hirschfeld, Rosh Kollel, Ateres Chaim Boruch (Torah L.I.F.E. ), Cleveland Heights, OH; Rabbi Yisroel Isaacs, Director of Kashruth, Greater Phoenix Vaad Hakashruth, Phoenix, AZ; Rabbi Yerachmiel Karr, Rabbinic Administrator, Vaad Hakashrus of Greater Waterbury, Waterbury, CT; Rabbi David Kitainik, Community Kollel of Greater Las Vegas/Jewish Learning Network, Las Vegas, NV; Rabbi Yossi Landa, Rabbinical Coordinator, Chicago Rabbinical Council (cRc); Rav Chaim Moishe Levy, Adath Yeshurun (IRG), Zürich, Switzerland; Rabbi Binyamin Marwick, Rav, Congregation Shomrei Emunah, Baltimore, MD; Rabbi Aaron Metzger, Director, New York State Kosher Law Enforcement; Rabbi Chanoch Oppenheim, Director, Charlotte Torah Center, Charlotte, NC; Rav Eliyahu Reingold, Rosh Kollel, Yeshiva of Greater Washington, Silver Spring, MD; Rabbi Mordechai Rhine, Rav, Southeast Hebrew Congregation, Silver Spring, MD; Rabbi Mordechai Rotstein, Kashrus Coordinator, Scroll K Vaad Hakashrus of Denver, Denver, CO; Rabbi David Russek, Assistant Rav, Centro Israelita de Costa Rica/ Rabbinical Kashrus Administrator, Costa Rica Kosher; Rabbi Dovid Schwartz, Rav, Congregation Sha’arei Tefilla, Providence, RI; Rabbi Pinchas Shedrowitzky, Field Rabbi Rabbinical Council of California (RCC); Rabbi Yonason Shippel, Founder/Director, The Beis, New, York, NY; Rabbi Simcha Snaid, Rav, Congregation Anshei Sfard, Louisville, KY; Rabbi Zvi Solomon, Rabbinic Coordinator, KVH Kosher, Brighton, MA; Rabbi Avi Stewart, Rav, Westwood Kehilla, Los Angeles, CA; Rabbi Moshe Walter, Rav, Woodside Synagogue Ahavas Torah/Executive Director, Rabbinical Council of Greater Washington, Silver Spring, MD; and Rabbi Dovid Yachnes, Rav, Orlando Torah Center, Orlando, FL. Rabbi Chaim Moishe Levy, Rav of Adath Yeshurun (IRG), in Zürich, Switzerland, attended the STAR-K Kashrus Training Program in 2006. This year, Felipe Kleiman, of Sao Paulo, Brazil, traveled the farthest to attend the 15th Annual STAR-K Kashrus Training Program– 4,751 miles. Mr. Kleiman has been involved in kosher meat production for 18 years; for 11 years, he ran kosher beef and poultry productions. Additionally, he works closely with Israel’s minister of agriculture in consulting for multi-million-dollar projects to adapt South American slaughter houses for kosher beef export to Israel. “I really enjoyed the program, especially the industrial shiurim and visits, since I am involved in the professional operational side of kosher production,” shares Mr. Kleiman, who deals with the engineering and management of production issues. 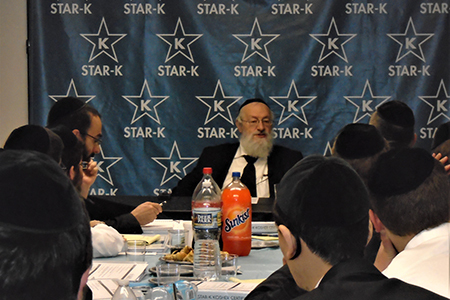 Rabbi Mosheh Levihim, who left his native Iran as a young man, in 1983, to settle in the US, had a different motivation for attending the STAR-K Kashrus Training Program. As the Rav of a Sefardic shul, Beith David Education Center, and a Rebbe in Or Hachaim Academy in Tarzana, California, he made the cross-country trip to upgrade his kashrus knowledge gained from his semicha studies, 20 years ago. “So much has changed in the industry, since then,” says Rabbi Levihim. “I learned a lot—everything from how to apply what I learned about toleim in a practical way to more efficient ways to kasher hotels and train my mashgichim. It was exactly what I was looking for.